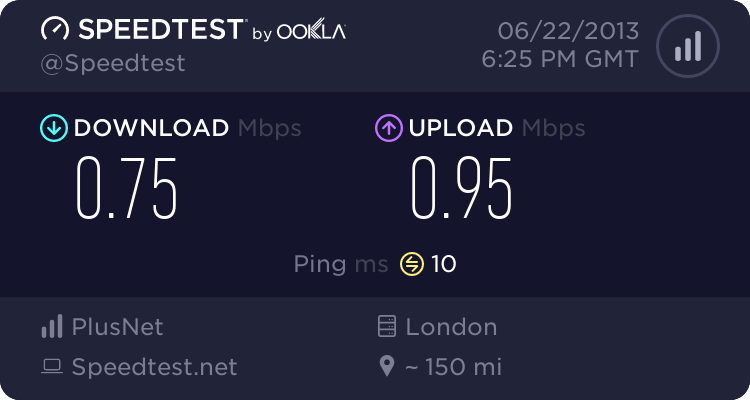 Lately, plusnet has been getting slower everyday, tonight I am running at 0.75 Mb/s download and 0.95 Mb/s upload. Before I signed up to this unlimited package I was averaging 15Mb/s. I suppose PlusNet unlimited is oversubscribed! We've been adding loads of capacity to keep on top of demand. Have you contacted our faults team at all? I am no expert on Broadband, but I have tried your fault finder page and got to the point where it asked me to try a different router. I do not have access to another router so I am stuck at the moment. Can I lend one from plusnet to test? I currently have the DGN2000, its about 2 years old. What are your router stats? What dies the Further Diagnostics of http://speedtest.btwholesale.com/ say (text boxes only)? 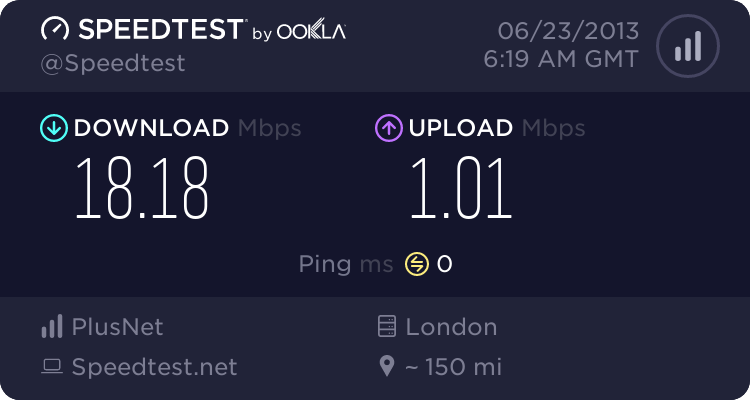 I have plusnet fibre All good here streaming and house hold is using BBC iPlayer also have you checked there's no issues with kit or service or are you being traffic shaped ? So it's possible certain exchanges will experience slow-downs because there's too many customers ? How can I find out if this is the case with my exchange ? PlusNet do not have control over exchange capacity, and if an exchange has a problem it affects nearly all ISPs at it. Somewhere to do with the OP's connection there is a fault, pure and simple messy. So does it suggest some sort of oversubscribing or congestion instead of a fault on the line or router?